The lifehackr diet plan; Who, What, Why and How? As much as it pains me to say this, I’m an ordinary guy. I don’t possess any superpowers like some people I know. I can’t sing, my body flails around in spasm when I dance and although I tried several times, I can’t play the guitar. If I was to possess a semi-superpower it would be an insatiable curiosity for how things work. I’ve always loved to fiddle with systems so that I could master them. Must be why I have been so attracted to technology; I don’t always “know” the answer but I am unafraid of fiddling or “hacking” until I find my way to the solution. At the start of the lifehackr diet plan story, I was approaching the ripe old age of 49 and had somehow ingested and retained 30- 35lbs of baby fat shed by my three kids (who are now teenagers). I was technically bordering on obese. I sat at a desk in my home office when I worked, I planned to go to the gym three times a week but rarely made it. I did a little bit of walking as we had recently adopted our first dog. At the start of the lifehackr diet story I was an ordinary guy. My journey started with the purchase of a Fitbit Zip in November 2012. This was my first brush with the Quantified Self movement. Suddenly I was able to track how many steps, miles, calories I had walked/burned each day. I started to use the food diary built into the Fitbit iPhone app to track the food I ate and therefore the calories I acquired. I soon realized that I had my fingers on the two main dials of a system that controlled my weight. What happens if I dial up the distance I walk, or dial down the amount of calories I consume? – I lost weight! “This is fun”, I thought to myself. I kept hacking at the variables and after six months I had lost 30 lbs and walked one thousand miles! After one year I had walked 2,117 miles or the equivalent distance from Boston, MA to Glenwood Springs, UT, about 2/3 of the way across the United States! I did all this walking while I was going about my normal daily activities, I did not go to the gym to walk! I repeat, I am a ordinary guy who made a series of small changes in my life which over months added up to something really big. The great news is these changes fit perfectly into my lifestyle because I made them and they are unique to me, so my weight loss and fitness levels are now in my control. What is the lifehackr diet plan? The lifehackr diet plan allows you to eat the food you like and still lose weight – but how? It’s actually simple because you are your own gate keeper for the calories going in and being burned off. By “shifting” your thinking about food, exercise and your daily activities, you can make small changes that add up to big results. The flow of data using the lifehackr diet plan principles. 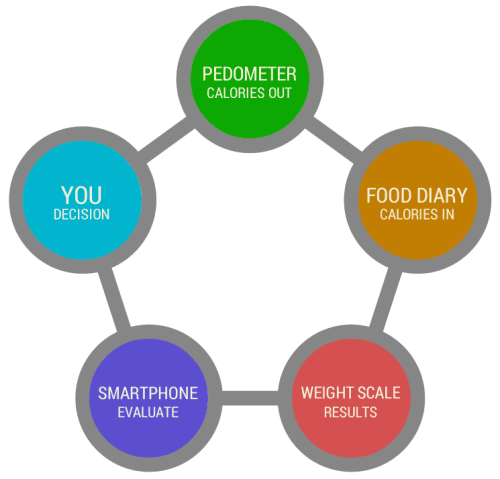 You will use a digital pedometer, a food diary and a body weight scale all which synchronize with apps on your smartphone. It takes less than three minutes a day to check and input your data. You will get accurate readings of your daily intake/burn balance so that you can make intelligent food and exercise decisions. YOU ARE MAKING THESE DECISIONS EVERYDAY ANYWAY, CONSCIOUSLY OR UNCONSCIOUSLY. The lifehackr diet plan simply empowers you with digital tools to help you make the right conscious decisions for yourself! I will show you how to hack your exercise and your food so that you can easily achieve and maintain your health goals and not starve. Why is the lifehackr diet plan right for you? Because you are the one who is going to make the small incremental changes that fit your lifestyle and personality. It’s all about you and how you want to live your life. So the lifehackr diet plan is for everyone who wants to make the effort to lose weight naturally; no pills, no powders, no crazy foods. Just Simply. Do you realize that if you walked one extra mile a day for a year, you could potentially lose 10 pounds? That is an extra 2,000 steps each day or less than 20 minutes of walking. When I go grocery shopping I walk an average of 1-2 miles! The lifehackr diet plan is all about making small changes to your life. The two main factors in your weight loss are exercise and food. Learn how to hack (or make small experimental changes) to your favorite foods and your work/daily chores/exercise/habits to see weight loss results. The lifehackr diet plan will show you how to go about your daily activities and maximize the calories burned by acting synchronously. That means when you have to make a choice between going grocery shopping or working out, you will now achieve both goals at the same time! I love guacamole and chips! Together they are perfect-ly evil to my calorie intake… On the lifehackr diet plan I learned to hacked my snack and now I love guacamole on sugar snap peas or mini sweet peppers and they love me! How can I start the lifehackr diet plan today? Signing up for the lifehackr diet journal, email newsletter. We will send you tips and tricks on a weekly basis to get you started. Checkout the lifehackr diet plan checklist to figure out what items you will need for the greatest chance of successful. Check out the free Quick Start page for an Illustrated guide for getting started right now. Engage in conversations throughout this website where there are comment fields.